Reducing the carbon footprint on the environment has been one of the key focus areas of research for TVS Motor Company. Over the years, the company has actively undertaken development of new technologies for reduction of emission and CO2 levels. The focus has been to create products, which will meet future emission norms – a crucial measure to protect the environment and ensure sustainability. Today, TVS Motor Company is proud to showcase its revolutionary ethanol powered motorcycle, TVS Apache RTR 200 Fi Ethanol. Ethanol is domestically produced from renewable plant sources. It is non-toxic, biodegradable and, safe to handle, store and transport. An oxygenated fuel that contains 35% oxygen, Ethanol reduces nitrogen oxide emissions from combustion. Apart from this, Ethanol as a fuel also helps reduce carbon monoxide emissions, particulate matter and sulphur-di-oxide. Use of Ethanol as a fuel will also reduce dependence on the import of petroleum and increase energy security. The TVS Apache RTR 200 Fi Ethanol is equipped with technical improvements to make the motorcycle reliable with Ethanol as fuel. It sports vibrant green graphics on the tank with a sticker to indicate ‘Ethanol’ thus lending it a stylish look. 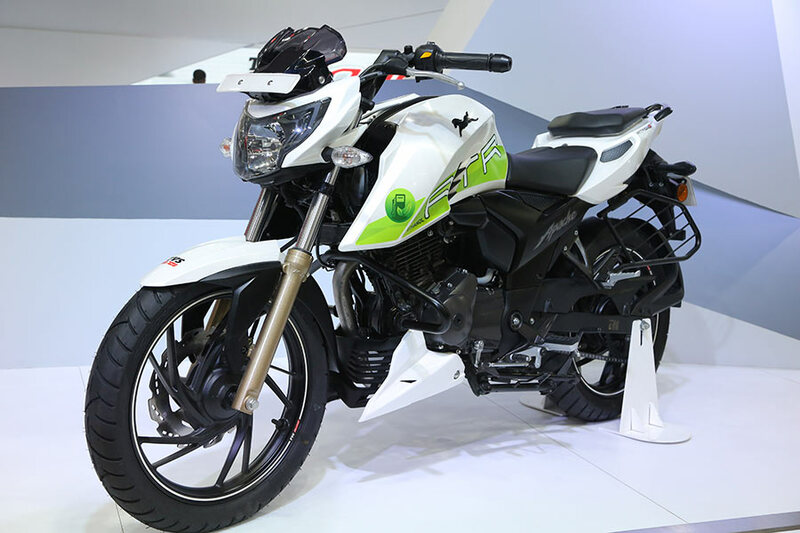 TVS Apache RTR 200 Fi Ethanol is also equipped with a Twin-Spray-Twin-Port EFI technology. This ensures better drivability, faster throttle response and further guarantees reduction in emission levels. With these factors in place, the engine operation becomes linear leading to better usable power under varied ambient conditions thereby increasing the performance. The E85 version motorcycle boasts of an impressive peak power of 21 PS @ 8500 rpm with a torque of 18.1 Nm @ 7000 rpm and has an ascending top speed of 129 kmph*. Promising superior performance coupled with a sustainable green solution, the TVS Apache RTR 200 Fi Ethanol is a through and through winner for the rider and the environment.